We traveled to the Sea Lion Caves, world renowned, and located 11 miles north of Florence on the coast of Oregon. The caves are fascinating – the largest in the world, at 125 feet. Although we couldn’t wait to visit the sea lions, no one told them. They had decided to spend the day sunning themselves on a rock further up the coast. Fortunately, we later stopped at a pull-out on the coastal highway and saw them. As Steve at the Sea Lion Caves told us, the Stellar sea lions (their species, not their performance) are free creatures that can go where they want, when they want. And, they certainly do. For many years, however, the sea lions have used the protected caves as a shelter. When the caves were first discovered in 1880, the sea lions were already in residence. They leave to seek food, procreate (often on the rock ledges in the vicinity), and explore. Massive creatures, Stellar sea lions, can weigh up to 2,400 pounds (the males), to 700 pounds (the females), and pups at birth (40-50 pounds). They, unlike the even larger seals, with which they are often confused, are not monogamous exclusively. According to exhibits down below in the 208 foot deep cave, the males can have 20-30 cows in their group. Unlike seals, which wean their young within a few weeks, female sea lions may nurse their young for up to three years! Talk about being nurturing! Years ago, the unenlightened in Oregon considered the sea lions a nuisance because they depleted the salmon stock which fisherman were after. They were hunted and destroyed. Now, the sea lions are seen as a treasure and it is illegal to hurt them. The sea lions typically live about 20-24 years, so the ancestors that were seen when the cave was first discovered have been prolific and survived despite the previous threat from mankind. The males, the bulls, have been seen as far away as Alaska – 4,000 miles away! It is amazing to see them use their front flippers to climb the rocks and waddle about. With coloring ranging from golden to brown to dark gray, they almost looked like giant slugs from the distance at which we finally saw them. They sounded like barking dogs and were quite noisy! They certainly moved quickly when the waves washed over them. But, their weight kept them from being moved too far. Only in recent years have the caves been accessible to crowds of tourists. 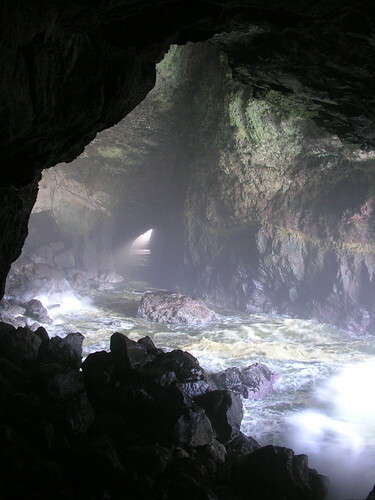 The Sea Lion Caves were difficult to reach at their level 208 feet below ground. So, in 1961, massive excavations were completed and an elevator installed down to the 215 foot vertical and 70 foot drift location, so people have the opportunity to see these amazing creatures. Also living near the Sea Lion Caves are black birds, Brandt’s cormorants, and sea gulls. 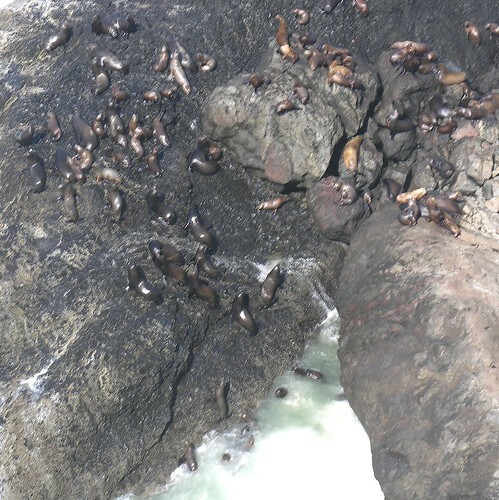 To learn more about the Sea Lion Caves, visit http://www.sealioncaves.com/home. There is a fee to descend to the caves. The caves are privately owned. The caves are not handicapped accessible since some stairs must be negotiated to reach the elevator. Tomorrow…Come back to see one of the most photographed lighthouses in the world. This entry was posted on Tuesday, September 15th, 2009 at 6:00 am	and is filed under Beach, Family Fun, Historic, Scenery, Travel. You can follow any responses to this entry through the RSS 2.0 feed. You can leave a response, or trackback from your own site.